When the engineers at OETTINGER lay their hands on a manufacturers sports version, then one can have high expectations. 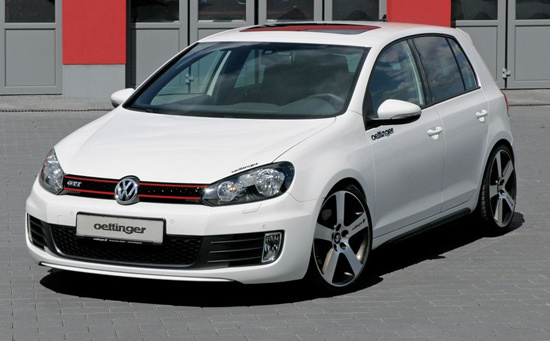 And the GTI is traditionally for OETTINGER an especially passionate project – a piece of company history lies behind the basic concept of the sporty compact vehicle: As creator of the 16 Valve technology OETTINGER made the first GTI possible over 30 years ago. With a skilful modification of the motor management, the team from Hessen help the latest GTI version, with manual and DSG transmission, to climb from 155 kW (210 hp DIN) to 184 kW (250 hp DIN) and allow the Speedo needle to charge round to 250 km/h (155 mph). This significant increase in power together with the strengthened torque of 360 Nm / 250 lb/ft (standard 280 Nm / 206 lb/ft) allows the OETTINGER GTI to accelerate to 100 km/h (62 mph) in only 6.2 seconds (standard 6.9 sec.). The performance enhancement via the OBD port is available immediately from the OETTINGER performance centres or directly from OETTINGER for 1,390.00 Euro. Further development stages for the 2.0 l engine to wide over 300 hp (DIN) as well as many other technical accessories will be available during the summer.